The Bantham deposits also produced a number of large unabraded sherds representing large parts of two other coarseware vessels that were clearly in use at the same time as the Eastern Mediterranean wares (importation conventionally dated to c. 450/475-550, and in the main deposit at Bantham probably belonging to the beginning of that period: Bidwell et al. 2011, 113). One was a gabbroic ware jar (Figure 2, no. 7), the other a straight-sided bowl (Figure 2, no. 8), the source of which is uncertain (Bidwell et al. 2011, fig. 24, nos 62-3). The Bantham jar (Trethurgy Type 4 with a slack-profiled neck, Quinnell 2004, fig. 54, P44-54), because of its association with the imported pottery, is important confirmation that production of gabbroic ware in the Romano-British tradition continued at least until the later 5th century (cf. Quinnell 2004,111; Thorpe and Wood 2011, 151). It also shows that after the end of the Roman period gabbroic ware vessels began to travel beyond Cornwall in small numbers (Bidwell et al. 2011, 115-16). Earlier in its history, a few examples of the ware had reached the Roman army and then the later 1st- and 2nd-century urban market at Exeter (Holbrook and Bidwell 1991, 183); the eastern limit of its distribution at this period was Pomeroy Wood (Seager Smith 1999, 307). It is not known from 3rd- and 4th-century contexts beyond Cornwall, apart from a few examples from Exeter that are typologically early and clearly residual occurrences. The single certain example of a late type – a flanged bowl – from Mount Batten (Bidwell and Silvester 1988, fig. 28, no. 29) could be a post-Roman import. On the north Cornish coast the distribution of gabbroic ware in the Roman period extended eastwards at least as far as Widemouth Bay, near Bude, where casual finds included sherds from two or three gabbroic vessels and other 2nd-century pottery – samian ware, a rough-cast beaker and a flat-rimmed bowl in South-Western BB1 (SWBB1) (Carlyon 1981; and see Quinnell 1995, 127, for other unpublished pottery from the site). The next site to the north along the coast, at Duckpool, produced a late Roman assemblage associated with six mid-4th-century coins (Ratcliffe 1995). Almost all the pottery was South Devon ware (505 sherds, many of them from a storage jar reused as an oven); there were also six sherds from a jar in BB1 from south-east Dorset and four unidentified sherds, but no gabbroic ware. Widemouth Bay might represent the eastern limit of the main distribution area of gabbroic ware in the Roman period; alternatively, the success of South Devon ware in the later Roman period might have made inroads into the market for gabbroic ware in eastern Cornwall, which earlier in the Roman period might have extended as far as Duckpool and even beyond into north Devon. Unfortunately, no late Roman assemblages are known from north Devon; the mid-Roman pottery from two unpublished sites at Brayford on the fringes of Exmoor includes small quantities of South Devon ware but no gabbroic ware (Bidwell et al. 2004; McBride 2008). Gabbroic ware also occurs at Tintagel among the material from the unpublished excavations (Quinnell 1995, 128, 16 sherds, including 'jar rims and parts of flanged bowls, generally poorly made'; Quinnell 2004, 120, body sherds from a Type 16 storage jar) as well as from the recent published excavations (Thorpe 1997 (2 sherds); Thorpe 2007, 229-31 (5 sherds); and possibly among the 8 native sherds from the Lower Ward, Thorpe 1988, 22). The ware is taken as part of the evidence for late Roman occupation on the site, which is also indicated by the presence of 'granitic' ware (presumably South Devon ware), Oxfordshire ware (OXRS) and a small coin hoard (Thorpe 2007, 231). All the South Devon ware, bearing in mind its absence at Bantham, should have arrived before the Eastern Mediterranean imports, but some of the gabbroic ware might be later. A third 'native' fabric 'with a variety of inclusions including shale fragments', described as local and first identified at Tintagel by Quinnell and Thorpe (Quinnell 1995, 128; cf. Thorpe 2007, 299, 'a few inclusions of local slate'), is of considerable interest. Heavily gritted wares with inclusions of slate, shale or shillett are well represented at the few sites that have been excavated in north Devon. They are all imitations of BB1, not only at the two Brayford sites but also at the much earlier 1st-century military sites on the coast at Martinhoe and Old Burrow (Fox and Ravenhill 1966, fig. 15, nos 1 (the upper part probably drawn upside down) and 3; re-examined by the writer in the North Devon Athenaeum). A few vessels in fabric 3 from 1st- and 2nd-century contexts at Exeter fit within the range of the North Devon fabrics (Holbrook and Bidwell 1991, 181-3). The Tintagel 'local' fabric might well represent an extension and continuation of this North Devon tradition into the 4th century and beyond. Six vessels have been illustrated (Thorpe 1997, fig. 54, RF 1096, 1078, 1480, and 1479/1487 (same vessel); Thorpe 2007, fig. 126, RF 3609 and 6022). One rim (RF 3609) is from a flanged bowl; in gabbroic ware this type was part of the late Roman range that continued throughout the 5th century (Quinnell 2004, figs 59 and 60, P131-6). Another distinctive vessel from Tintagel is a straight-sided bowl with a slight thickening around the rim (Figure 2, no. 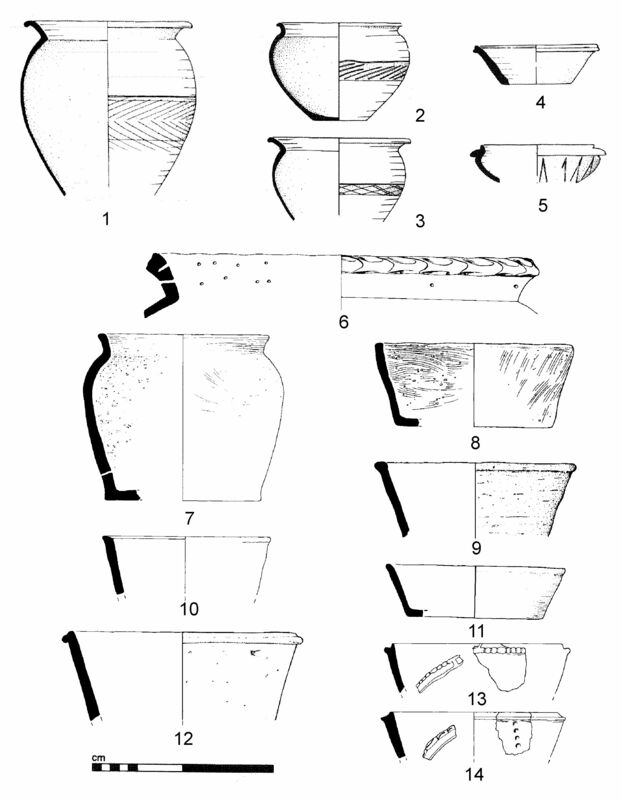 9); it is in 'native' ware but was published before this general category was sub-divided into gabbroic, granitic and local wares (Thorpe 1988, 22, fig. 7, no. 18). It is paralleled in gabbroic ware at Trethurgy (Figure 2, no. 10) and at two other sites in Cornwall (Quinnell 2004, fig. 60, P137, with reference to unpublished finds at Carwarthen and Porthmeor). It is also similar to the bowl at Bantham (Figure 2, no. 8), which is in a fabric rich in muscovite (Bidwell et al. 2011, fig. 24, no. 63). The temper was from a greissenised granite, and if the source was South-Western, the petrological study by Taylor confined it to the Lee Moor area of south-west Dartmoor, the St Austell area or minor outcrops on Bodmin Moor or the Land's End area (cited in Bidwell et al. 2011, 108). The possibility that the vessel was imported from Brittany was also considered; Breton pottery has granite-derived fabrics, but little is known about its forms in the 5th century. Now that parallels to its form are apparent in Cornwall, a South-Western origin seems more likely. The similarities between these simple types in gabbroic ware and probably in at least one other South-Western fabric might not be the result of imitation. From the BB1 production site at Bestwall Quarry there are plain-rimmed dishes dated to c.AD 350-400+ that are smaller in diameter and proportionally deeper than their common forerunners and approach the proportions of bowls (Figure 2, no. 11, as Lyne 2012, fig. 154, no. 7, cf. Lyne's Class 8/14-15). The substitution of a single multi-functional form in BB1, gabbroic and at least one other South-Western ware for two separate forms – the bowl and the dish – might have been part of a general tendency to simplify pottery production at the end of the Roman period and beyond. Another likely instance of simplification is the reduction of the flanges on conical flanged bowls to mere vestiges, as with Type 47 in BB1 (Figure 2, no. 4; cf. Figure 2, no. 12 from Bestwall Quarry, as Lyne 2012, Class 6/11). This also occurs in gabbroic ware and in grey wares at Bath (Green and Young 1985, fig. 89, nos 69-70) and, on a flanged dish, at Nettleton in Wiltshire (Wedlake 1982, fig. 112, no. 475). What remained of a flange on the Nettleton dish had piecrust decoration, which was also found on the vestigial flanges of two bowls in gabbroic ware from Trethurgy (Figure 2, nos 13-14: Quinnell 2004, fig. 60, nos 135-6). Once the original purpose of these flanges was forgotten, they might have been seen as purely decorative (the full-size flanges were presumably either seatings for lids, probably inverted plain-rimmed dishes, which overlapped the lips of the bowls or were to make lifting or tilting the bowls with one hand easier). In passing, it is worth commenting on a striking aspect of the 'native' pottery at Tintagel, which in its scarcity when compared to the large areas that have been excavated and their much greater yield of post-Roman imported wares. Trethurgy produced 8496 sherds of pottery, much of it late Roman or 5th century in date and including only 108 sherds of Eastern Mediterranean wares (Quinnell 2004, 97); from the relatively small-scale excavations at the late Roman site at Duckpool there were 515 sherds. The focus of late Roman occupation at Tintagel might have lain in the unexcavated areas of the island or even on the mainland. Also worth noting is the presence of two Oxfordshire ware (OXRS) vessels at Tintagel – imitations of the samian ware Drag. 38 as Young 1977, C.51.1 (Thomas 1993, fig. 67). The Oxfordshire parchment ware bowl at Bantham (Bidwell et al. 2011, fig. 23, no. 63) seems to have been a survival, and it is possible that the Tintagel bowls arrived after the end of the Roman period. Some 1st- and 2nd-century samian ware continued in use until the 4th century and is even found in Anglo-Saxon graves (Wallace 2006). The red colour-coated types in Oxfordshire ware included many passable samian imitations and were perhaps manufactured as late as the first decade or so of the 5th century. It would not be surprising if these bowls were still in circulation, and second-hand objects of very limited trade, towards the end of that century.